Researchers in the US have designed a novel material that can catalyse two separate, sequential reactions to produce industrially relevant intermediates in one pot. Solid catalysts are important in the chemical industry for accelerating the production of compounds that make commodity goods. The catalysts are typically nanometre-sized metal or metal oxide particles supported on a high surface area solid. They can be modified chemically to tune their performance, but it is difficult to catalyse multiple reactions with only one material. 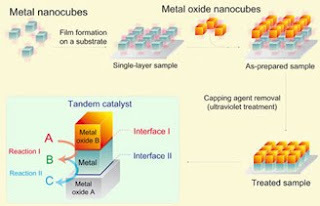 Now a team led by Peidong Yang at the University of California, Berkeley, has developed a nanocrystal catalyst that incorporates multiple metal-metal oxide interfaces and can catalyse two different reactions in sequence. Platinum nanocubes were assembled into a one nanocube thick monolayer with oleylamine capping agents in between the cubes and transferred onto a flat silica (SiO­2) surface. A second monolayer made of ceria (CeO2) nanocubes spaced with oleic acid was then placed on top to form a bilayer. UV irradiation removed the capping agents to leave vertical gaps between the stacked nanocrystals. This provides a high surface area, and clean metal-metal oxide catalytic interfaces. 'With our novel concept of interface design through nanocrystal design we have a versatile principle where multiple interfaces can be assembled, be responsible for separate reaction steps and ultimately lead to great reaction selectivities, says Yang. To test the bilayer structure, the team used the two distinct metal-metal oxide interfaces - CeO2-Pt and Pt-SiO2 - to catalyse two sequential reactions. CeO2-Pt catalysed the decomposition of methanol to CO and H2, which then made propanal byPt-SiO2 catalysed ethylene hydroformylation. 'This work will be high impact in the catalysis community and in industry, getting people to think about smart catalyst design, which is the core for energy and chemical provisions,' says Edman Tsang, an expert on solid catalyst design at the University of Oxford in the UK. He goes on to say however, that unwanted side reactions could occur with reactants or products being converted by the wrong catalyst interface. 'There is still a long way to go for this concept to flourish. But the design is indeed interesting,' he adds. Yang believes that the tandem catalyst could be easily used in large scale industrial processes. 'One could simply devise a scale-up process for producing tandem oxide-metal junctions using a colloidal route,' he says. He explains that the next step is to explore new oxide supports such as TiO2 in the catalyst designs. 'We are starting to explore the same concept with multi-step photoelectrochemical reactions such as solar water splitting,' he adds.